Expecto patronum! Also, will you marry me? 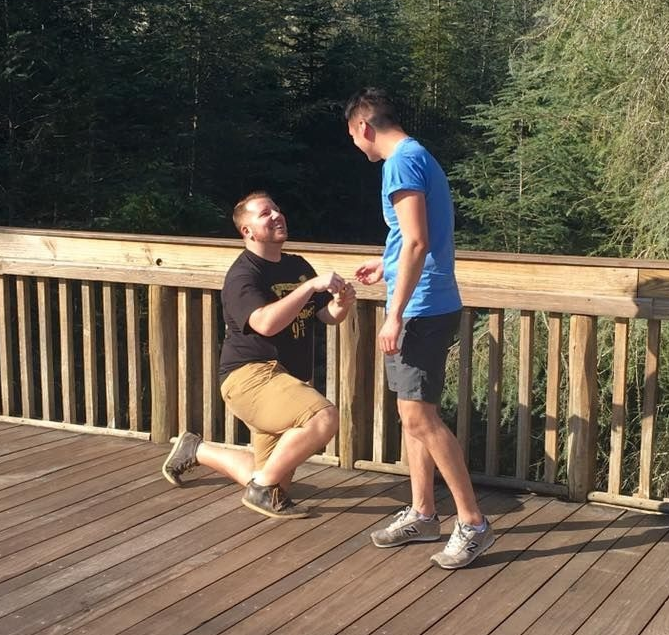 These days grooms-to-be have a job on their hands when they’re planning a marriage proposal. Elaborate YouTube flash mobs, intricately planned treasure hunts and ‘secret’ proposals dragged out over an entire year (like this guy’s sterling effort) have raised the bar for everyone else. Somehow the old hide-the-ring-in-the-pudding-at-a-fancy-restaurant-dinner trick no longer cuts it. Tailoring the proposal to the proposee’s favourite hobby or passion is always a winner, and for one particular guy the theme for his intended husband-to-be had to be Harry Potter. 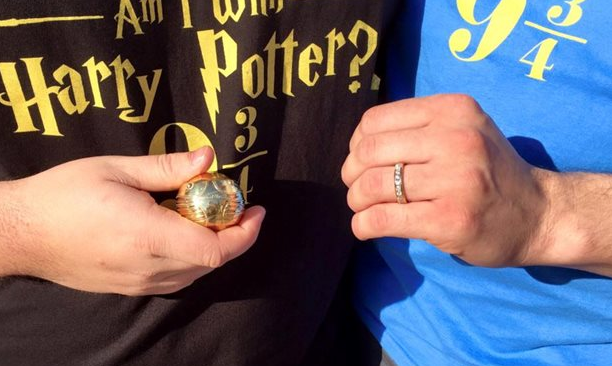 So when an Imgur user by the name of Derreck James Walker visited the Wizarding World of Harry Potter with his boyfriend, he secretly brought along an engagment ring inside a 3D printed golden ring box which – and here’s the best part – was made out of a snitch! 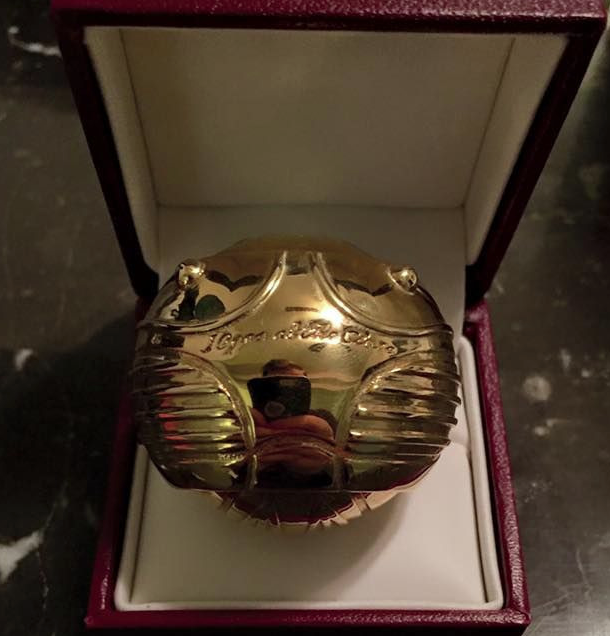 For those of you who haven’t gobbled their way through the Harry Potter books (we won’t ask why) this is the tiny, winged golden ball which a ‘Seeker’ has to catch to end a game of Quidditch – oh never mind, just read the books. 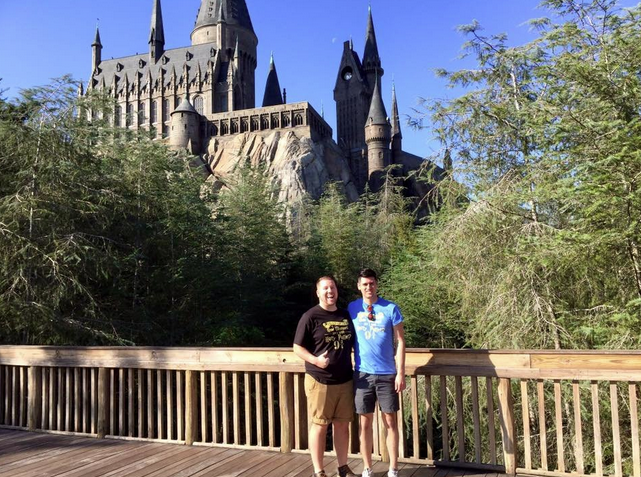 As the pair posed for a photo in front of the Hogwarts castle – wearing matching Harry Potter T-shirts – Derreck gave a happy little here-we-go thumbs up to camera before dropping to one knee, producing the snitch from his pocket and popping the question to his unsuspecting partner. The lucky guy of course said yes. How could he not? Bravo, Derreck!